Selling books… sort of. To date, I’ve ‘sold’ 465 copies of my free book, Ten Little Stars. I ran a promotion for the book on Kobo* (£3 for a week) at the start of March and downloads have been consistent ever since, averaging 15 a day. So far, it has translated into one sale of one of my other books, though I can’t prove the two are related, but no sign-ups to my mailing list yet (I advertise both in the free book). I think, however, this is a long-term process so I’m not discouraged. And it is gratifying that at least someone is reading my stuff. The picture at the top of this post is an extract from Ten Little Stars. I’ve been experimenting with images for Pinterest and Instagram. I’m a words woman, rather than pictures so I took an extract from the book, blew up the font size, used the snipping tool to make a file in Paint and voila – a neat little extract in a picture. Finishing off the sequel to Highland Fling. Stand-alone books don’t work as well in the indie world as a series, so I took two of the support characters from Highland Fling and gave them a story of their own. It means I get to stay in Lochalshie, the Scottish village I made up which is based on the town of Arrochar in Argyll and Bute. If Highland Fling is loosely based on Pride and Prejudice as most romance novels are, Highland Heart is more along the lines of Persuasion, thank you Jane Austen. Celebrating my mum’s birthday. Brenda B celebrated her birthday on Friday, so we gathered together at my sister’s house for a family celebration on Saturday. My sister outdid herself with the food – pulled pork, two different types of salad, sausage rolls, sausages (get the feeling we’re pig mad in my family?! ), potato salad and a birthday cake made from individual chocolate brownies. Sleeping with your cat is good for you. Fact. Spending quality time with the cat. Well, why wouldn’t you? He’s a lovely bundle of furry fun. *May the universe rain down blessings on Kobo and the excellent tastes of Canadians in general, to date the biggest proportion of the Ten Little Stars down-loaders country-wise. Made cakes! 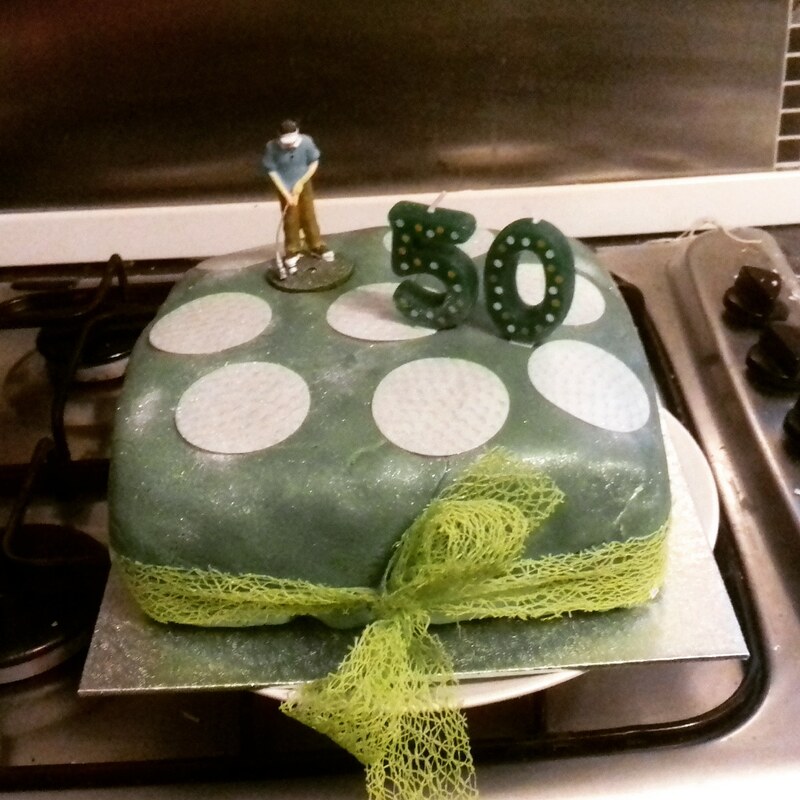 The man in my life turned 50 this week, so I made him a golf themed cake—mainly because the decoration didn’t seem too complicated. Green icing*, a golf figurine and some golf ball wafers equals job done. I’m not a talented baker. It requires precision whereas my first instinct when I look at any recipe is to wonder what would happen if I switch one ingredient for another and double up the cheese quantity specified. Then there’s that whole cake tin thing, where every single recipe for cake appears to use a different-sized tin. True. Do proper bakers have room in their kitchens for a dedicated cake tin cupboard stacked from top to bottom with tins of varying sizes? Luckily, I found this handy conversion calculator on CakeBaker which gives you ingredient quantities for your size of tin. I made a Madeira cake as that’s one recommendation for celebration cakes—sturdy and minimal crumble, apparently. The filling inside is home-made lemon curd (see this super easy microwave recipe here) and the cake’s iced with lemon butter cream and topped with green fondant paste. Did my first trail run. Pounding the pavements can get awfy boring after a while, so I ventured up into the hills behind my house this week. It’s seriously hilly, but the deal was I could walk in places just like proper trail runners do. Another added bonus is that you don’t take in lungfuls of exhaust fumes. Trail running is supposed to benefit your training regime as you use different muscles and it gives your brain more of a challenge as you tackle varying terrain. Moved out of my comfort zone. On my list of ‘to do’s’ this year was to do a book event. As an introvert, I prefer hiding behind my laptop when book promoting. The arguments in favour include the ability to reach far more people and it’s much less time consuming/a better return on investment. Nevertheless, you don’t grow as a human unless you venture out of the places you find safe, so I approached my local library and asked if they’d be willing to run a Q&A event where I and another writer talk about our books, our writing processes and self-publishing. Times and dates are still to be confirmed, but the event will take place during Scottish Book Week, 19-25th November. Yike-sy. More details to follow. beautiful biters Finished a book—or the first draft of it, anyway. I’ve finally written ‘THE END’ (among the world’s most satisfying sentences to write) of Beautiful Biters. It started life as Beauty and the Vampires and then got a name change half-way through. 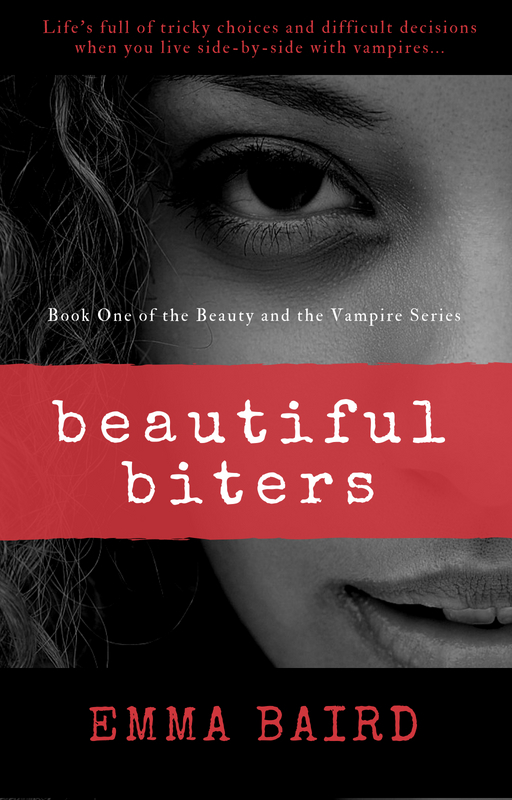 It’s a story about a 16-year-old living side by side with vampires and doing make-up tutorials for them on YouTube as I wanted to give it a modern feel. Now my least favourite part of writing begins; the rewriting bit. Ker-ist. I’d rather pluck my own eyeballs out. Or start another story so Beautiful Biters can meet the fate of all my other books—rusting away, forgotten and neglected, in the back of my hard drive. Ate delicious Indian food. Sandy and I went out with his family to celebrate his half-century. The Dining Room is a local restaurant you’d be within your rights to describe as a “wee gem”. It’s tiny, so we were the biggest party in there and everyone joined in when we sang Happy Birthday. My go-to with Indian restaurants is saag paneer and Tarka dhal. Indian and Pakistani cuisines do amazing things to vegetables, and make the prospect of full-time vegetarianism do-able. What highlights has your week brought? And what’s your favourite dish in an Indian restaurant? *I say ‘not complicated’ but the air around me turned blue as I tried to fit that f*****g fondant paste on the cake.